How to choose the affiliate program for your website? How am I going to make a profit? For your ease and convenience in understanding, let me split this tutorial into three parts. Writing about OptinMonster is not new to me. As I have already written a detailed review on it. Before I show you how to purchase OptinMonster account. Let me answer a question that will be nagging your mind right now. OptinMonster is a paid lead generation software. Why should I invest in this? So, for buying OptinMonster for a year, I will have to spend $228. How am I going to make a profit out of it? Just keep this question in mind. I will answer you at the end of this tutorial. On their homepage click “Get OptinMonster Now”. 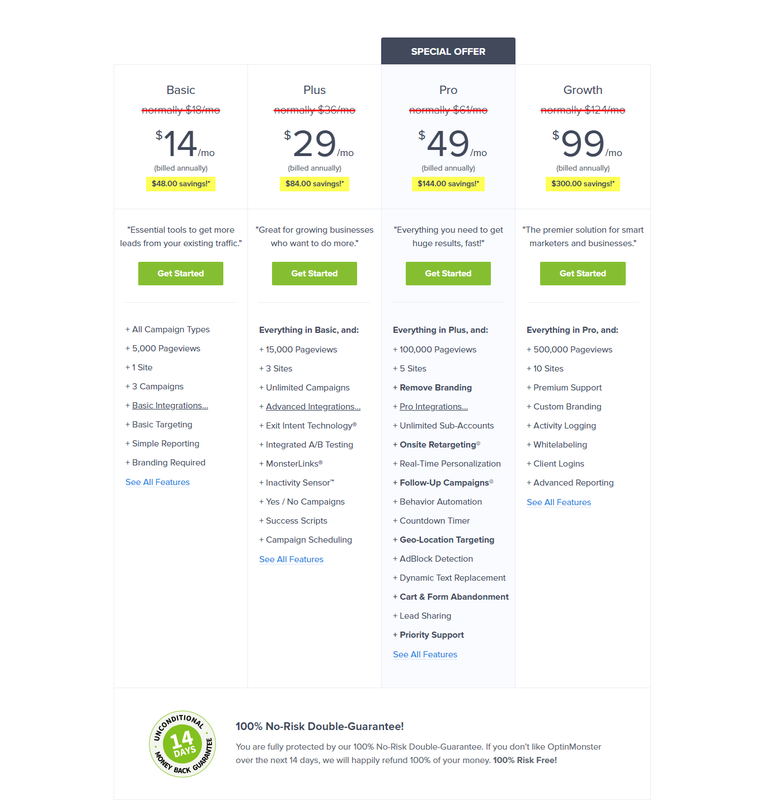 In the Pricing page, you will have to choose the membership that you want. Basic membership will be sufficient. If you are going to implement this on multiple websites, you might need Plus membership. Click “Get Started” under the membership that you are about to purchase. 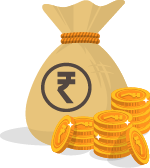 Now, fill the details requested in the Payment page. Coupons are a great way to save money on your purchase. 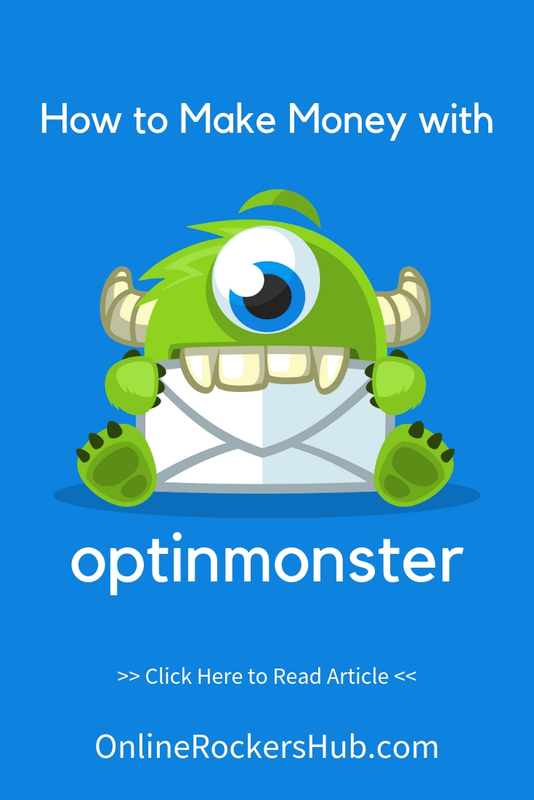 Look out for OptinMonster coupon codes at the notification bar of this page. And then, you need to fill your First Name, Last Name, Email Address, and Payment Information. 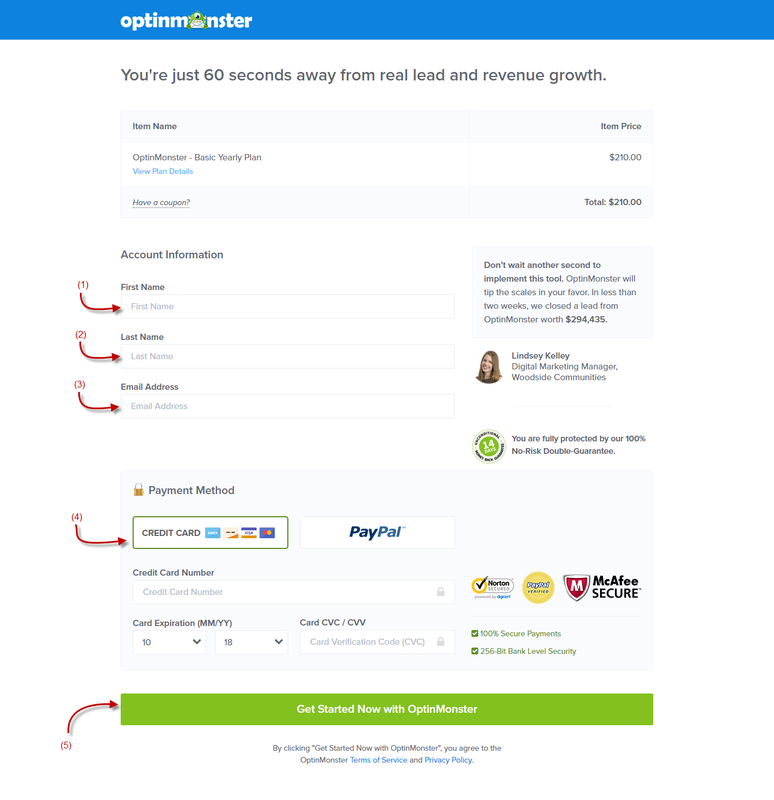 Once you have filled, click the “Get Started Now with OptinMonster” button to complete your payment. 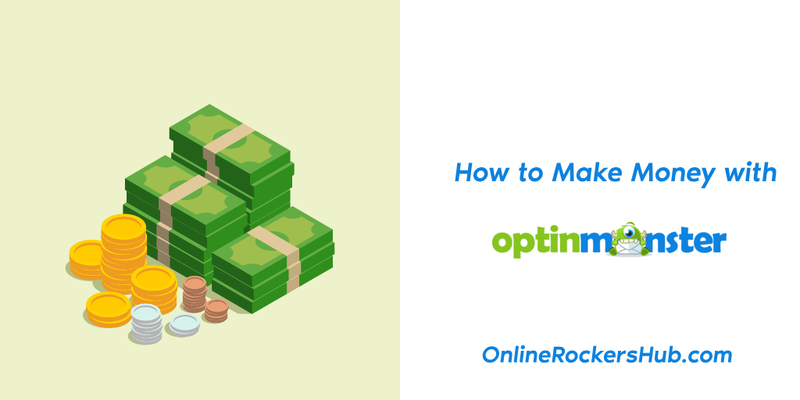 After your successful payment, you will have access to your OptinMonster account. The second part is where you need to apply your ideas. Choosing your Affiliate program is the most important part of the tutorial. To choose the right affiliate program for your website, you need to know who your audience is. For example, OnlineRockersHub consistently shares articles on WordPress niche. So, my readers are most probably WordPress users. When it comes to WordPress, the three most important product categories associated with it are Web Hosting, WordPress Plugins, and WordPress Themes. There is a plethora of free WordPress Plugins and free WordPress Themes in the WordPress repository. So, buying a premium WordPress plugin/Theme is not a necessity for my audience. It is optional. But, coming to Web Hosting, you can’t think about free Web Hosting. Every WordPress user needs to spend some money on it. Compromising on the budget of Web Hosting will lead to compromising the performance of your WordPress website. So, promoting a Web Hosting offer to my audience will bring me more conversions and generate affiliate commissions. Okay, there are so many Web Hosting services available. Which one should I join and promote on my website? Is it a quality product that experts recommend? Which is the cookie period? Is a legit affiliate program? For this tutorial purpose, I am choosing it to be Hostgator. Did you notice what did I do throughout this whole part? It is not that I am promoting Hostgator web hosting on my website. The point is that how did I choose Hostgator web hosting to promote. The methodology matters! Every website will have its own niche and its own audience. It’s up to you to identify your audience and choose the product that would satisfy your audience and promote it. Let’s get to the last and final stage. For this part, I will be creating a Pop-up campaign at OptinMonster. Just follow my steps to create a campaign. Step 1: Login to your OptinMonster dashboard, and then click “Create Campaign”. 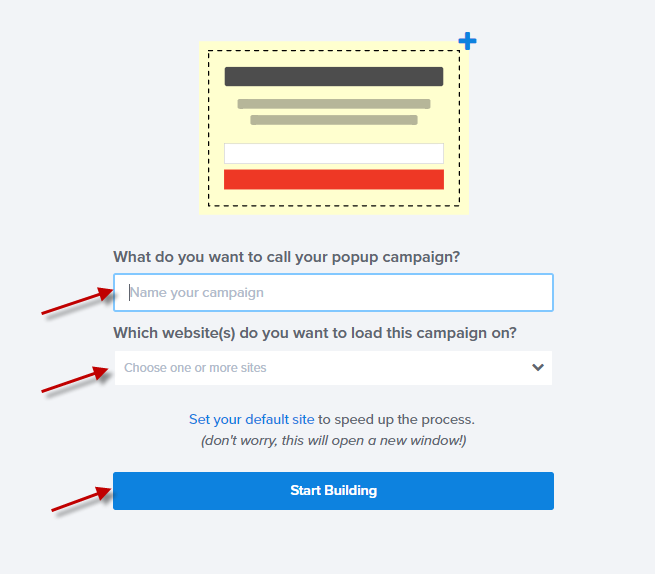 Step 2: Select the Campaign Type to be Popup. Slide-in and Floating Bar are other two campaign types that would work well for our purpose. Step 3: Choose the Campaign Template that will suit your website design. I am going to promote my Hostgator Coupon code to my audience. So, I am choosing Coupon Campaign Template. Step 4: Now, you will have to enter the details of your campaign. Give a suitable name for your campaign and add the website, where you want to display your campaign. If your website is not listed, then add your website. Step 5: The next step is to edit the design of the Popup. Now, here is the difference I am going to make. I am not going to use this as an email optin. I am actually going to divert my visitors to my affiliate site using my affiliate link. So I am removing my email field, and adding a Call to Action Button. When a visitor clicks the Call to Action Button, he will be redirected to my affiliate link. In your Editing window, click the Button, and go to the Action tab. Enter your Affiliate link for Redirect URL. And then, add the coupon details. After editing, this is how my popup looks. I am setting the conditions like, “If the visitor is about to leave my website and he has not opted to my Affiliate Marketing Newsletter, I am going to display him my Hostgator offer”. This is how my conditions will look like. You can skip the Integrations section because we are not having email optin on our popup. Connecting your OptinMonster campaign with Google Analytics will help you analyze your metrics in the future. Just connect with your Google Analytics account, choose your Website Profile and click Next. After successful connection, move on to Publish Tab. The final step is to publish your Campaign. Turn on the Campaign Status to Live and then Click Save. Don’t forget you need to integrate OptinMonster with your website. If you are using WordPress, the simplest way to integrate is to use OptinMonster Plugin. Else, you can always copy and paste the Embed code within the </body> tag of your website template file. After Integrating, I am testing if the campaign works. So, on the front end, this is how the Popup looks. I just clicked the “Use Coupon” Button and I am redirected to my affiliate link. So, the campaign works perfectly on the front end. Let me come back to the question which I put in the first part of this tutorial. It costs $228 per year for OptinMonster. How can I make a profit out of this investment? Let me show some simple math for you. Let’s say, for each month two users are making use of my Hostgator Coupon code and purchasing Hostgator hosting. For each sale, Hostgator is going to pay me a commission of $50. So for each month, I am going to earn $50 x 2 sale = $100 commission. Investing in OptinMonster can bring 4 times the profit. Try this on your website and share the results with me on the comments section. If you need any more assistance, feel free to drop me an email. If this idea works for you, pin this.